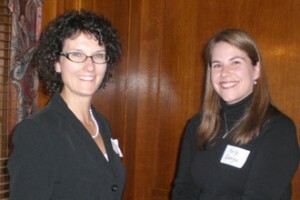 On Thursday September 18th, 2009, more than twenty women of the Metro Women Chemists Committee gathered for a networking dinner at Fairleigh Dickinson University in Madison, NJ. Dr. Kathryn Uhrich, Dean of Math and Physical Sciences of the School of Arts and Sciences at Rutgers University and founder of Polymerix Corporation gave an inspiring and insightful presentation on her road to success. She shared some professional and personal stories from her career path and stressed to the group that one person can make a substantial difference in the lives of others. It was a wonderful opportunity to meet, interact and network with women in the North Jersey/New York area. 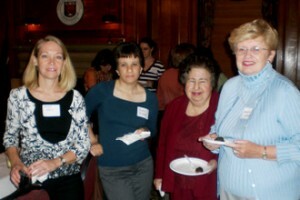 Anne Kelly, Jacqueline Erickson, Susan Fahrenholtz and Maureen Chan enjoying the evening.